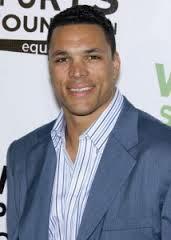 Tony Gonzalez Joins "The NFL Today"
February 20, 2014 - CBS Sports has announced that recently retired All-Pro tight end Tony Gonzalez will be joining the network’s Sunday morning pregame show, “The NFL Today.” To make room for the future Hall of Famer, analysts Dan Marino and Shannon Sharpe will not be returning for the 2014 season. Gonzalez played 17 years in the NFL, 12 in Kansas City and the last five in Atlanta, and retired as the all-time leader in receptions, yardage and touchdowns for a tight end. CBS Sports President Sean McManus feels that the 14-time Pro Bowler will be a welcomed addition to the set alongside James Brown, Bill Cowher, and Boomer Esiason. While McManus offered praise for his new hire, he also acknowledged outgoing analysts Marino and Sharpe. “Dan Marino and Shannon Sharpe have contributed greatly to the success of “The NFL Today” for more than a decade," McManus said. “Dan and Shannon are true Hall of Famers on the field and in front of the camera. As they pursue other professional opportunities, we thank them for their hard work and dedication and wish them nothing but the best." With Marino’s exit after 12 years at CBS, there is speculation that the Hall of Fame quarterback might be returning to the Miami Dolphins in some capacity. As for Sharpe, who has been with CBS since 2004, he will likely bring his brash and opinionated commentary to another network.